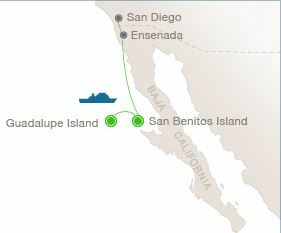 Located 150 miles SW of Ensenada, Mexico, Guadalupe Island is an approximately 18-hour crossing aboard the luxurious and steel-hulled Solmar V.
Guests are escorted in comfort aboard an air-conditioned coach from San Diego to Ensenada. Pick up is at 10AM on October 12 from the Hampton Inn San Diego, once we clear the US/Mexican border at Tijuana, it’s a 1 1⁄2 hour scenic drive down the coastline of northern Baja. Solmar V departs Cruiseport Marina at approximately noon for Guadalupe Island. We arrive Guadalupe Island on Day 2 in the early morning, which gives us plenty of time to get the shark cages in the water and begin your unforgettable adventure. Cages are in the water from sunrise to sunset on Days 2, 3 and 4. Escorted panga (skiff/Zodiak) rides around the island have become a very popular feature on Solmar V trips to Guadalupe Island. Our onboard amateur naturalist, Geronimo, has been with us for over 12 years and has developed quite a following among our guests. Geronimo appreciates the opportunity to share his knowledge of the area, particularly the seals and the birds, creating another fantastic opportunity for photography and video. As we bid adios to the seasonal, prolific great white shark population of Guadalupe Island at the end of Day 4, settle in for the comfortable crossing back to Ensenada, arriving by noon on October 16. We then transport you back to San Diego aboard the air-conditioned coach. Due to unpredictable circumstances at the Tijuana/San Diego border, we advise guest to book return flights either late that evening or the next day.